This event will take place in the newly equipped Spartan Rehearsal Room in Denison Hall. Free and open to the public. Parking information below. Contact Paul Ferguson with any questions. Edwin Anderson (1933-2018), was Bass Trombonist with the Cleveland Orchestra from 1964-1985. He later taught at Indiana University from 1985-2012. A graduate of the Eastman school and student of Emory Remington, he also performed with the orchestras of Buffalo, Cincinnati, and Chicago. Allen Kofsky (1926-2018), performed with the Cleveland Orchestra for 39 years (1962-2001) under the direction of such renowned conductors as George Szell, Lorin Maazel, and Christoph von Dohnanyi. During World War II he joined the Navy, hoping to play with the Navy Band but after scoring so well in boot camp on the international morse code, he was assigned to a minesweeper in the Pacific as a radio operator, seeing action at Guam and Okinawa. As second trombonist with the Cleveland Orchestra, he also played bass trumpet and euphonium and taught for many years at Baldwin Wallace Conservatory. Bill Watrous (1939-2018), redefined jazz trombone technique and was heard often on studio recordings by artists like Quincy Jones, Prince and Frank Sinatra. In a nearly 50-year career, he released more than a dozen albums under his own name, spotlighting his eloquent and often startling playing in a range of contexts. For a time in the 1970s, he led a jazz-rock big band, Manhattan Wildlife Refuge, which released two albums on Columbia Records. Bill’s professional career began in the 1960s, when he played in ensembles led by the trumpeter Billy Butterfield and the trombonist Kai Winding and contributed to albums by the likes of Woody Herman, Wes Montgomery, Milton Nascimento, and Chick Corea. Urban Clifford “Urbie” Green (1926-2018), was an American jazz trombonist who toured with Woody Herman and Gene Krupa. He played on over 250 recordings and released more than two dozen albums as a soloist, and was highly respected by his fellow trombonists. Green’s trombone sound was especially noted for its warm, mellow tone, even in the higher registers where he was more fluent than most trombonists. He may be best known for his “21 Trombones” recordings from the early 1970s. John Marcellus was trombone professor at the Eastman School from 1978-2014. Previously he held positions with the National Symphony and founded the Eastern Trombone Workshop. His students hold posts in various orchestras and universities around the world. 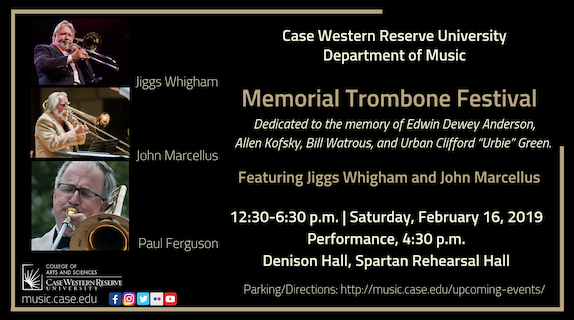 Jiggs Whigham is one of the premier jazz trombonists of the last half-century. In a career split between Europe and the US as the world’s most traveled trombonist, his contributions in education and performance are incalculable. Paul Ferguson is Artistic Director of the Cleveland Jazz Orchestra and Principal Trombonist and arranger for the Cleveland Pops. A graduate of the Eastman School and veteran of the Glenn Miller and Tommy Dorsey orchestras, he has taught at CWRU since 1988. The most current information about University Circle parking can be found at Uptown Cleveland and University Circle. Triangle Lot and Garage: This is a surface lot located off Mayfield, next to the Triangle Apartment Building. The first two floors of the Triangle Parking Garage are available for visitors to MOCA and Uptown. Courtyard Mariott Lot: This is a surface lot located off Mayfield, directly behind Chopsticks and across from MOCA’s loading dock. Ford Parking Garage: On Ford Avenue across the street from MOCA Cleveland. Lot 22B: Entrance off Mayfield. Located behind the University East building and row of restaurants. Metered parking is available on the street along Bellflower Road.